Author’s Note: This is my first attempt at a video review. I know I probably look a little silly, and for some reason, even though I was in the house by myself, the camera was intimidating. I hope you find it useful, and be sure to let me know what you think! If you like it, I’ll keep it up, but if I’m just another yahoo trying to making it big on the youtubes, then please let me down gently. Some Thoughts on Nathan: Last Christmas I got the Nathan HPL #008 Race Vest from my father. I had asked for a race vest, but didn’t specify which one, so was pleased to see that it was a Nathan. I’ve been using Nathan Quickdraw handheld water bottles pretty much exclusively for the past few years, and while the water bottle itself isn’t anything special, they seem to have the best hand strap design, with the perfect size pockets for some fuel. The Vest: The vest itself seems just about ideal for medium length long runs (13-25) or a race where you can fill up at an aid station. The bladder holds 1.5L of water, (for a reference, that is about 1.5 Nalgenes ). 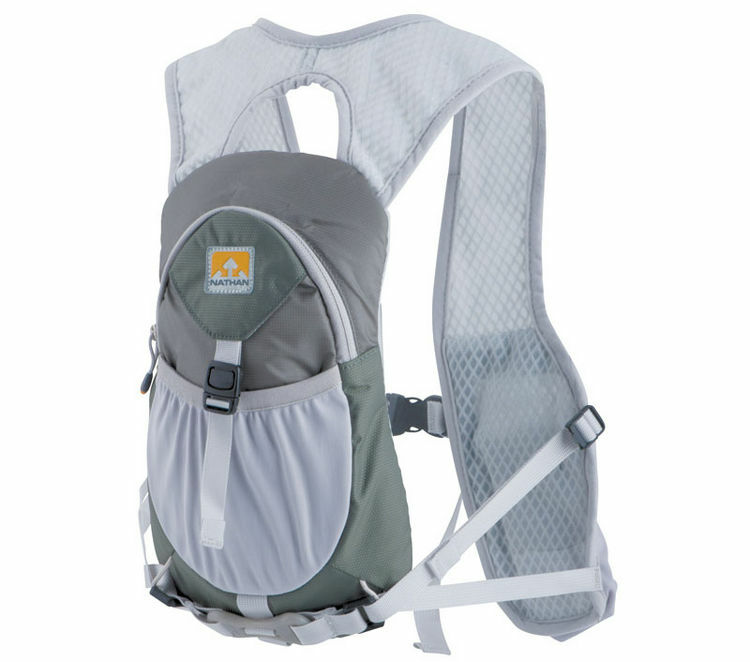 It sits high and tight on the upper part of your back, which keeps the vest from bouncing around while running. After having used it for about 100 miles, I can say that I haven’t had any issues with it rubbing or chaffing around the arms. They claim it is 1 size fits all, but for bigger builds I’d be sure to try it on. While the pack is adjustable, it is designed to fit tightly I’d be careful. The vest has 3 main pockets, plus a pocket for the bladder. The largest pocket in the back is designed for a hat or gloves that you wish to store away. It could probably fit a very light jacket, but nothing much more than that. The two in the front are both large enough for a few Clif Bars or several gels. The larger has a zipper and the smaller, more of an elastic pocket with a pull-tie. The pull-tie holds really well and has kept everything secure that I’ve stuffed down there. Issues: My only two complaints are with the front zippered pocket. I find this pocket to not be very useful once I’ve started to consume some of the calories I’m carrying. The pocket is large, which is great, but once you remove something everything starts to bounce. Unless it is packed in, the pocket isn’t tight enough to keep things secure. The other thing I think would be nice is a hook for keys. That would be an easy fix in the next model. Summery: All in all it is a great pack I’d recommend to anyone. I like the way it rides and I like the quick fill features of the bladder. Unless you are going out in extreme cold where you need more room to store layers, or out for 40 miles with no aid, you should be fine with this pack. 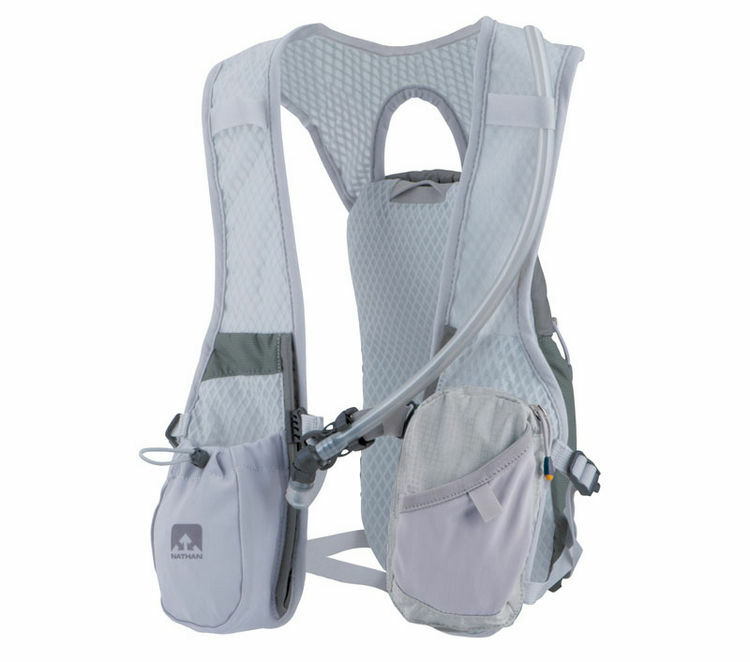 It is great for running, or would be a good, light alternative to a larger backpack for a day hike. You can pick up the pack at nearly any REI or some running stores, or use the link below for Amazon. Call for Response: Have you used this race vest? What did you think? Do you have another race vest you love? CamelBak, Nathan, or another brand? I like the new format, Doug. I really feel like video is the best medium for reviews like this – gives us a chance to really see what a product can do. Now how is the Nathan with venting heat at the contact points? I’ll tell you, the biggest issue I’ve had with Camelbak is that the areas that touch the back and straps end up 10-20 degrees hotter than the rest of my body. That always felt, uh, unhelpful considering that I only wear it when it’s already hot enough to require extra H2O. Thanks Tim, I’m glad you liked the video. I agree that it is a nice format to really show readers the product and how it works. That is a great question, and unfortunately one I can’t fully speak on. I got the vest for Christmas, so most of my running has been in non-summer conditions. I can tell you that while the straps and shoulders seemed to remain cool, where the bladder rests on the upper back did heat up a bit. I imagine that during real summer heat this could cause some discomfort. I’ll be sure to update the review after a few warmer runs. Thanks for asking! Like the new format, and I checked out the guide to Rock Creek – very nice. Haha, you mean Nathan? That’s the company. I tend to call it Aquarii though. Glad you like it! Thanks for checking it out.